Bohemian knotweed is a vigorous and fertile hybrid that is the result of a cross between Japanese and giant knotweed. There is a high degree of morphological variability in Bohemian knotweed. 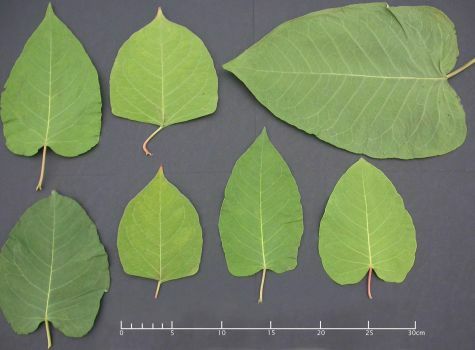 Physical characteristics of bohemian knotweed range from being indistinguishable from Japanese knotweed to being indistinguishable from giant knotweed, with most individuals exhibiting intermittent characteristics between the two species. Bohemian knotweed infestations take several years of treatment to control and the most effective method is repeated herbicide application. Contacting a natural resource professional as early as possible is integral to knotweed control. If you see bohemian knotweed contact the Oregon Invasives Hotline as well as Lincoln SWCD by phone at 541.265.2653 or email.